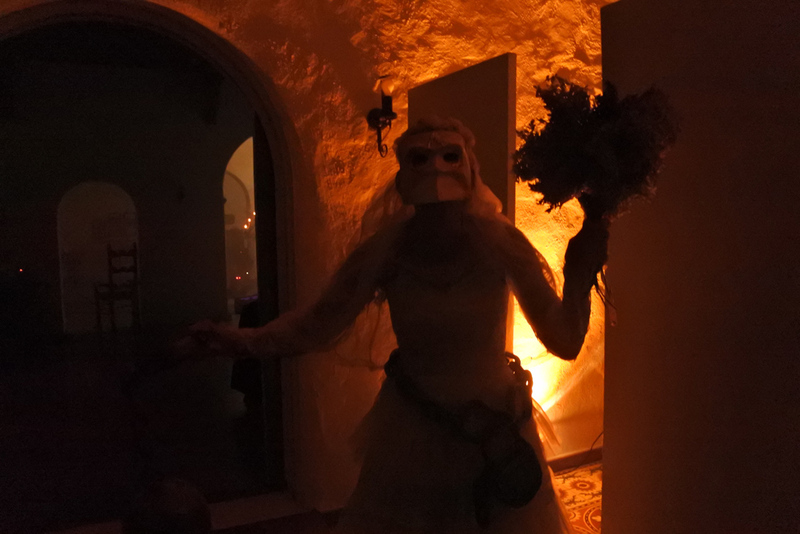 Editor's Note: As a belated epilogue to Halloween 2016, Hollywood Gothique correspondent Blackmouth offers this report of spending Halloween Night in Orange County, where he visited a trio of terrifying attractions: Ferris Haunt, the Haunt at Daisy Avenue, and Casa Creepy. 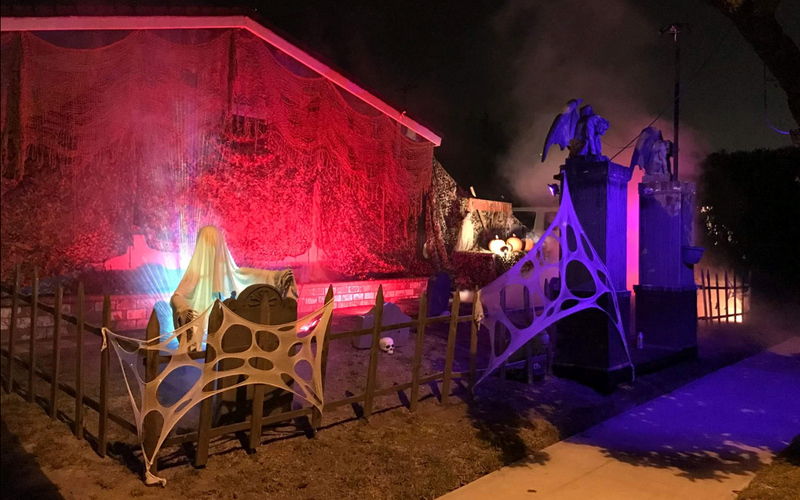 Located in a jovial community where all neighbors seem to celebrate Halloween, Ferris Haunt typically has an annual walk-through but decided to cut back to a yard display for Halloween 2016 - unfortunately, the very year that Hollywood Gothique finally visited! The yard displays turned on at dusk, and it actually got spookier as it got darker. Eventually, the fog rose; a Trio of Jack O' Lanterns began to serenade, perhaps attempting to distract from a well-timed surprised jump scare....or two. From afar, this display really lighted up the street! Though outside of Los Angeles, this family-friendly haunt is definitely worth the drive because of the neighborhood. 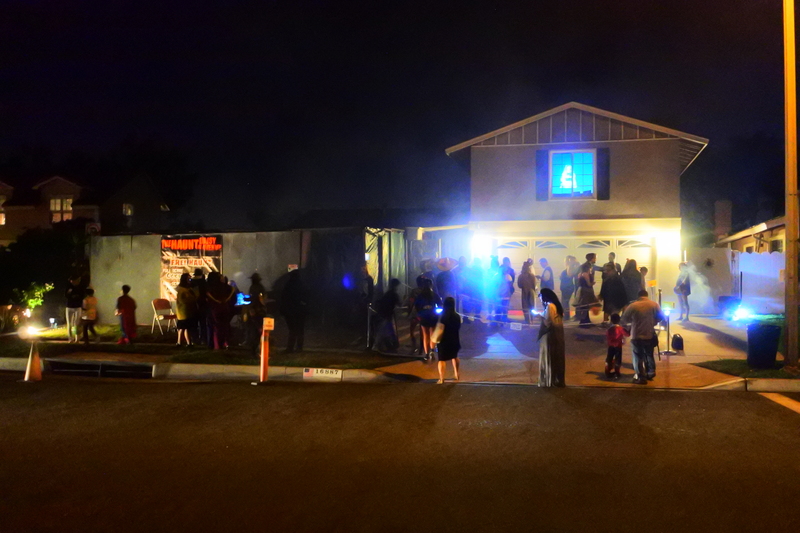 There were a few nicely decorated homes nearby in this “trick-or-treating” community. Plus, with the haunt proprietor's help, we discovered two more haunted mazes on the corner of Cerulean and Chase Street, a couple of minutes away from Ferris Haunt. You can follow Ferris Haunt on their Facebook page for updates on what's to come. The haunt proprietor has already got the planning process underway! Ferris Haunt is generally open from Sunset to 9:30 PM in the 2nd half of October. Situated in a Halloween-friendly community, this attraction provides trick-or-treaters with their fill of candy and thrills. This is another first-time home haunt for Hollywood Gothique, though the word “home” should be taken very lightly or not at all, because this maze rivals that of a professional theme park haunt. Most of the props are handmade by the proprietors, and they are strictly a product of their passion. That passion is indeed reflected throughout the walk-through. As we approached the maze, we could see a floating spirit in the top attic window, foreshadowing terrors to come inside the maze. Once it was our turn, we entered the home through an old train station turn style. 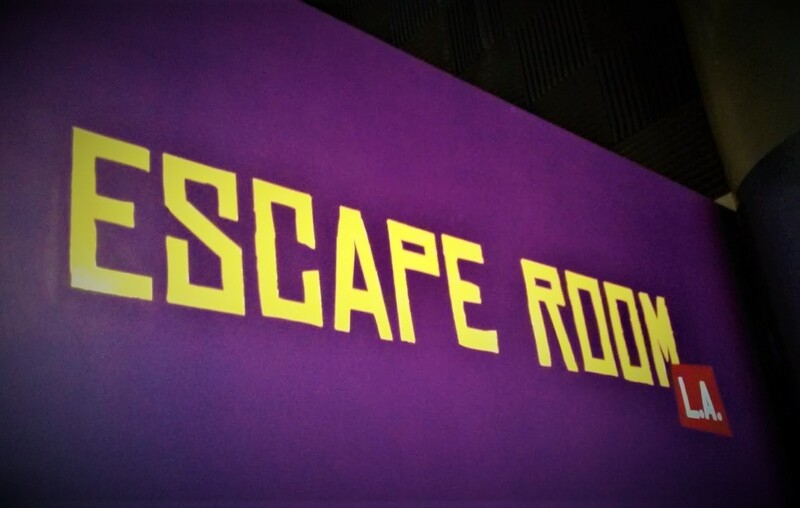 Each turn hid a new surprise; each room and hallway offered a jump scare with characters acting accordingly to the set decor, background music, and sound effects - which were present throughout the entire maze. Which begged the question: Are we still in a home, or have we entered some dark, demented realm or tormented reality? The further we went, the more we could tell that some dark spirit was haunting this property. The highlight of our night was perhaps the nun who said a chant and then beseeched us to move toward the light, where - on a large and detailed set of a mausoleum and chapel - we were met by a ghost bride who desperately sought to marry me involuntarily, insistently saying “I Do" until I could escape from the altar. You too may be lucky enough to enjoy such a pleasant exchange if you can get past the skulls, the spirits, the apparition, the chef and his bodies, and the medium with her moving Ouija board clearly telling you to get out while you still can! The haunt stays true to this year's theme: "If the fear doesn't kill you, something else will." 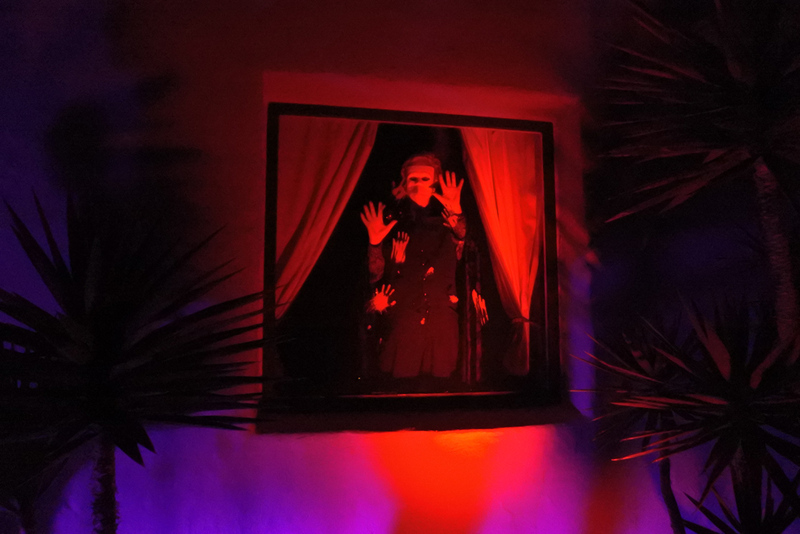 The Haunt at Daisy Avenue offers a new theme each year and typically opens on Halloween Night from 6 to 10PM and Nov 1st for a non-scare walk-through from 7-9PM. In an industry where the season seems to start earlier each year, this is definitely well worth the wait for Halloween Night. Hollywood Gothique had the pleasure of attending Casa Creepy's inaugural haunt, which plans to become an annual attraction. Set in a house built in 1927, it features old-fashioned Halloween atmosphere, with werewolves, vampires, and Frankenstein's monster. We walked down the narrow path between grave markers, ghosts in the trees, and a skeleton in an open grave; along the way, a werewolf ambushed us. After the woods, we approached an outdoor theatre screening Nosferatu (1922). The audience was filled with cadavers and skeletons who were simply enjoying the movie - until we interrupted their viewing by walking in front of the screen. Then the audience turned ugly and scared us out of there! We continued past a couple of animatronic jump scares until we were greeted by a masked phantom behind a window with bloody hand prints. The outdoor trail lead us into a building where “Moonlight Sonata” was being played by a live pianist (a nice surprise). A ghost bride stopped us to say she was looking for the groom who left her 90 years ago; she wanted me to stay outside (presumably to marry her), but she changed her mind and allowed me and my female companion inside. The room resembled Dracula's lair, with a moving coffin, well placed grave markers, and phantom figures. Candlelight, somber music, and a blaze set a tragic tone. Next we encountered a room full of witches with something brewing on the table - and a jump-scare hidden beneath the table. We then entered a lab with a mad scientist shouting “It's Alive!” "It" turned out to be Frankenstein's monster, who showed up out of nowhere behind us! The exit route led us past creepy old photos, a drop-panel, and a room full of black magic props. A Gypsy Flapper appeared and yelled: “Get out while you still can!” We took her advice and survived the night. Casa Creepy reminded us of the Halloween mazes that haunt-goers used to see inside shopping malls and strip malls. It brought us back to a time when you could find an enjoyable haunt experience for $10 to $15 instead of heading to an expensive theme park. 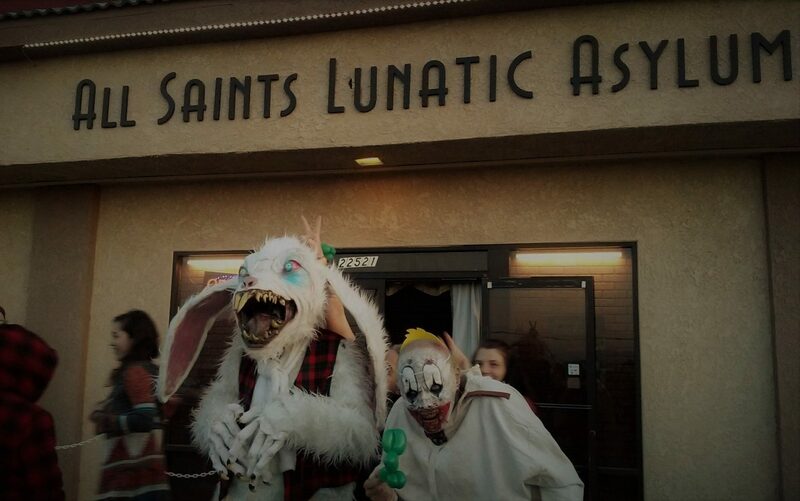 Costumes were also encouraged for those striving to brave things that go bump in the night. Admission was $12 for non members and $10 for members. The hours for the first year were Oct, 29 – 31 from 7 to 9PM. Recommended for ages 7 and up.